I’m making refried beans as the basis of my meal tonight (they’re cooking now; I’m not exactly sure what’s going to happen with them), but I wanted a tossed salad to go along with it. I realized I didn’t know of any particularly Mexican salad dressings, so I threw this together. It turned out pretty well so I figured I’d post it. Mix all ingredients together and adjust any of the ingredients to taste. … but now that I’m all into grilling, I’m thinking it might be a good marinade for grilled veggies. I bought a pint of them – they are yellow – at the farmer’s market a few weeks ago and when I realized I wasn’t going to be able to use all of them, decided to pickle them (basically I’m pickling everything that crosses my path this summer). I think I just stuck them in cider vinegar with some peppercorns and hot pepper flakes (the peppers were fairly mild). The following week I made “real” pickled jalapenos by looking up recipes and seeing how you are “supposed” to do it (this involved cooking the jalapenos). I photographed that one, so when they’re ready (two more weeks), I’ll do a post. Torticia helped me eat my salad. Sorry, no pics of Gomez tonight; he was sleeping during salad time. He is, however, helping me type this post, although he’s really hindering more than helping. Now I need to extricate myself from Gomez and this laptop and go check my beans. It occurred to me tonight that it’s been a week since I’ve made a post and may well be another week before I’m able to make another. I have a lot going on right now, including hosting a large party this weekend, and I’m probably not going to be cooking anything new, let alone taking pictures of it. In the meantime, please enjoy the kittens and I’ll be back in a week or so. Do you see the orange M on Torticia’s forehead? I’ve been reading about cat genetics and apparently orange in cats is always tabby; what appears to be solid orange in some cats is really striped. That goes for the orange in tortoiseshells. Additionally, tabbies almost always have an M on their foreheads (both Tigger and Brachtune, as well as every other tabby I’ve ever known, did). So although most of Torticia’s colouring seems to be entirely random, in many places, her orange appears as tabby stripes. It’s particularly obvious in the orange bands around her front legs (totally adorable), but I missed her orange M for a couple of weeks. Once I spotted it, though, I can’t NOT see it. Mark claims the M stands for Mark; I claim it stands for my last name. Gomez’s black-on-black stripes (not really visible in this photo; I love that you can only see them sometimes) are called ghost stripes. I had a black cat, Dracula, growing up (I have a tattoo in his honor), and I’ve been friends with several other black cats over the years, but Gomez is the first black kitty I’ve met with noticeable stripes, though apparently it’s fairly common because the gene that suppresses the tabby stripes in solid cats doesn’t always manage to fully suppress it. You can make out a faint M on his head as well, but it’s much harder to see than Torticia’s scarlet letter. It’s hot here in the DC metro area. It’s been hot for weeks. Personally, I’m loving it, so you’re not going to hear me complain. I’ll take 100 degree temperatures over a blizzard any day. I might feel differently if we didn’t have air conditioning, but frankly, Mark keeps it so cold at home, and our building management keeps it absolutely frigid at work (I actually sometimes use a space heater; how ridiculous is that? ), and I’m cold when I leave the pool at the gym, and it’s always freezing in stores, so I actually consider it a relief to go outside. Our pool doesn’t work any more, so I don’t spend nearly as much time outside as I used to, unfortunately. Anyway, although I don’t feel all that affected by the crazy heat (watch our A/C break now that I’ve said this), I’ve been feeling a bit summery in the kitchen. That is, I eat a lot of pickles during the summer so I’ve been making a lot of pickles. Actually, I make and eat a lot of pickles all year round, but I’m trying to make this post topical. Also, I have been making pickles from stuff I get at the farmer’s market, so that’s seasonal. In fact, I have a pint of yellow jalapenos that I think need a vinegar bath. And a huge bunch of radishes. But today I present you two very easy, classic refrigerator pickles that I made a couple of weeks ago and am now ready to eat. Chop the cucumber(s) into spears and lightly smash the garlic with the side of a knife. I also sliced the majority of the seeds off the cukes. Put the rest of the ingredients except the dill into a large jar, cover, and shake to combine. Put the cucumber spears, garlic, and dill into the jar. Top off with water if necessary to cover the cucumbers. Refrigerate for at least a week (10 days is better). Trim the green beans. Lightly crush the garlic with the side of a knife. For extra spicy green beans, make a cut in the jalapeno. Add all ingredients to a large jar, topping off with water if necessary to cover the beans. Refrigerate for at least two weeks (three is better). Gomez is a bit more laid back, although he does leap around and act just as nutty. I think his philosophy is to sit back and let Torticia tire out their prey and so he can go in for an easy kill later. I don’t have the heart to tell him Turbo Scratchers don’t tire out. 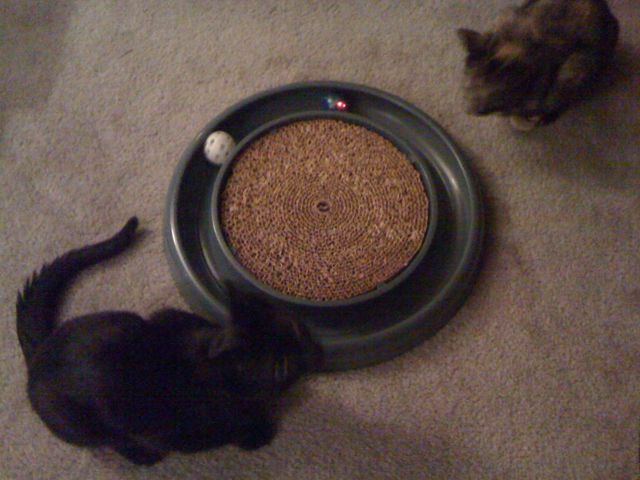 For those of you who didn’t see it on Twitter, here’s my hilarious joke – it’s the Large Cat Toy Collider. We’re hoping to find the Gomez boson. I don’t know why this surprised me so much, because they sleep together a good 80% of the time, usually in one of their two cat trees, but I was taken aback for a second to find both kittens on the back of my chair. I guess it is because both Tigger and Brachtune liked to sleep there but there is no way in hell they’d ever both be there at the same time. This picture somehow hides the fact that Gomez is now a full 25% larger than Torticia. He’s an enormous giant. When I was in high school, I worked in a local grocery store. It was the cool place to work; everyone in my high school worked there. When I applied, I assumed that like all of the other female teenage employees, I’d become a cashier. I was a little disappointed when they told me I’d be working in the bakery, because I thought I wouldn’t see all my friends, all the females of whom were cashiers. It didn’t take long for me to realize that working in the bakery was the very best assignment possible. The bakers, who all started at some obscene hour like 4 a.m., went home about half an hour after my weekday shifts began, which meant I was working with no supervision all night long. 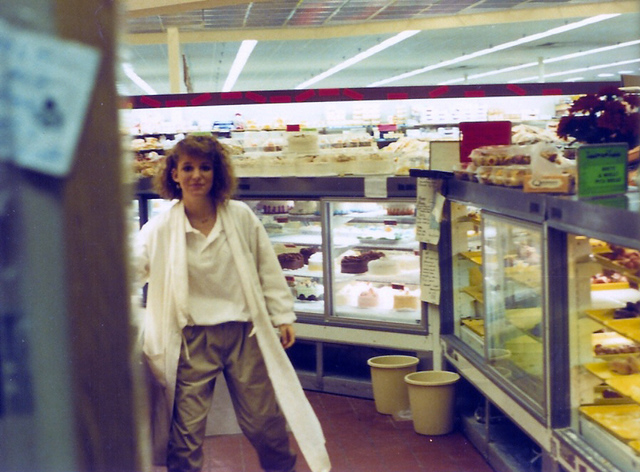 Shortly after I started, one of my best friends applied to work in the bakery with me and was also hired, which meant we spent every night goofing off, decorating donuts with cake icing and putting them out to sell, decorating cakes with our own ridiculous drawings, and chasing around and being chased by the produce guys, whose back room was connected to ours. I guess we somehow managed to do our work as well because I got along very well with the bakers, with whom I did have to work on Saturday and Sunday mornings. This is me behind the bakery counter, selling my donut wares. This is my friend, Dawn, looking at me through a cart of “trayed-up” frozen rolls. We had to do “tray-up”, which involved lining frozen rolls and breads on trays, putting them on a cart, and pushing them into the freezer, every night. I used to leave the bakers stories about the Tray-up God on the backs of the tray-up checklists. I’m very curious now to know what the heck I wrote, but one of the bakers told me at the time she saved them all. I’m sure they were ridiculous. Anyway, if you’d have told me when I worked in the grocery store bakery that I’d one day consider being a baker, I’d have called you crazy. I couldn’t fathom the hours, for one thing (really, I still can’t), and it just didn’t seem very me, as much as I did like my after-school job. Culinary arts weren’t something I aspired to or had any interest in. Then when I went vegan and started teaching myself how to cook, I tried baking bread a few times and never had any success, so I gave up for several years, although I did get a bread machine. Eventually I got tired of the bread machine – it made funny shaped loaves and the paddle kept coming off and getting baked into the bread – and I tried my hand at baking by hand again. This time I for some reason had success, and after baking several breads from recipes off the internet, I got The Bread Baker’s Apprentice. I don’t want to sound overly dramatic by saying it changed my life, but in a way it did, because I always thought I just didn’t have a knack for bread, but after buying that book, I did have a knack for it. Or, more likely, Peter Reinhart is just really good at teaching bread baking, even through a book. And his breads taste amazing. If you have any interest in bread baking, I can’t recommend his books, particularly this one, enough. After my huge successes baking nearly every bread in that book and his others, I fell in love with it so much I have considered working in a bakery – baking this time, not washing dishes and arranging frozen rolls on trays. We’re not doing much for the Fourth of July this year – just hanging out with the kittens and taking care of some stuff around the house – but I usually try to at least loosely follow tradition for holiday meals, so I decided I’d make homemade veggie burgers today and I decided to make Peter Reinhart’s kaiser rolls for them. These kaiser rolls taste amazing. They are definitely the best kaiser rolls I’ve ever had. I never fail to think of the frozen kaiser rolls I used to tray up in high school and always think how much better these are. I’m normally hesitant to publish Peter’s recipes because I really do want you to buy his books, but I found the following online in several places (including Google Books). The only change I’ve made is I substituted En-R-G egg replacer for the egg he calls for, though I suspect you could just leave it out entirely. Also, I doubled the recipe in the book, which made six rolls, because if six rolls are good, a dozen is even better. They freeze well. The measurements below are Peter’s original for 6 4-ounce rolls, but you’ll see my doubled measurements in the pictures. Finally, I’ve said it before but I’ll say it again: Weigh your ingredients. If you are at ALL interested in baking, buy a scale and use it. I’ve included the volume measurements because I’m a nice gal, but it is very hard to consistently measure ingredients – especially flour – by volume. * Peter says you can use all all-purpose or all bread flour if that’s all you have, but that this combination seems to yield the best results. The night before baking, make the pate fermentee. I didn’t take pictures of this, but all you need to do is add all the dry ingredients to the bowl of your electric mixer (or a regular bowl if mixing by hand), then add 6 ounces of the water and mix on low speed or stir for about a minute until everything comes together in a coarse ball. Add the extra water if there is loose flour left over. Then mix on medium speed for 4 minutes, or knead by hand for 4 to 6 minutes, until the dough is, in Peter’s words, “soft and pliable, tacky but not sticky”. Lightly oil a bowl, roll the dough in the oil, then cover the bowl with a plate (in lieu of the plastic wrap Peter calls for). Leave the bowl out at room temperature for an hour or until the dough has risen to 1 1/2 times its original size, then refrigerate overnight or up to three days. When you are ready to bake, remove the pate fermentee from the refrigerator. Remove it from the bowl and use a bench cutter (or a serrated knife) to cut it into about 10 small pieces. Cover with a tea towel and let come to room temperature for an hour. When the hour is up, add the flour, salt, malt powder, and yeast to your mixing bowl. Add the pate fermentee pieces, egg replacer, oil, and 5 ounces of water. Mix on low speed for a minute (or stir by hand) until it comes together in a ball. Add the additional ounce of water if there is still loose flour. Mix on medium speed for 6 minutes (10 minutes by hand), adding flour if needed, to “make a dough that is soft and supple, tacky but not sticky”. I like to finish it off by hand for a few seconds for a smooth dough. It should pass the windowpane test. Lightly oil a large bowl – I use this dough rising bucket from King Arthur Flour – roll the dough around in the oil, and cover with a large plate or lid. … remove it from the bowl, knead very lightly to degas (you don’t want to “punch down” dough as old recipes tell you to do; it’s too harsh), and return it to the bowl. Here I am weighing the individual rolls. I was surprised, however, when the last roll weighed in at only 3.75 ounces, even after I’d weighed the first eleven twice each and they were all exactly 4 ounces. What this tells me is my scale is not as precise as I’d like it to be. I just took about .05 ounces off the five rolls that looked the biggest and added it to the runt. … creating and smoothing a seam, whilst creating surface tension on the opposite side. Turn over and smooth into a round with your hands, seam side down. … cover with a tea towel and let rest for 10 minutes. Prepare a baking sheet by lining with parchment or a Silpat and misting lightly with oil. Shape the rolls into kaiser rolls by using a kaiser roll cutter or by using this shaping method. (It was very hard for me to get pictures of this, so I suggest you read the book for a much better explanation.) Roll each roll into a rope about 8″ long. Tie the rope into a simple knot. Tuck the ends of the knot into the middle of the roll. (I didn’t get a good picture of this.) Tray the rolls, cut or prettier side down. Cover with a couple of layers of tea towels and let rise for 45 minutes. Preheat the oven to 425 degrees Fahrenheit at this point. Turn the rolls over. If you want to seed your rolls, mist lightly with water and sprinkle with poppy and/or sesame seeds. Cover again, and let rise for another 30 to 45 minutes, or until doubled from their original size. Peter recommends spraying the walls of the oven with water just after putting the rolls in, but I used a different technique of his and instead poured 1 cup of hot water into a cast iron pan I keep on the bottom shelf of my oven. If you go the water-in-pan method of creating steam, make sure the pan was preheated with the oven. Put the rolls into the oven and steam using one of those methods, then bake for 10 minutes. After 10 minutes, rotate to the pan and reduce the heat to 400 degrees, then bake another 15 to 30 minutes for large rolls (less for small rolls), or until golden brown. Transfer to a cooling rack and cool for at least 30 minutes before serving. Here are the veggie burgers I made; I baked them in the toaster oven. … and my whole meal. As you can see in the last picture, I also made Bianca’s deviled eggs, and they are amazing! They really do taste like the real thing and were at least as easy to make. I probably can’t get away without posting any kitten pictures, but since this has been such a long, photo-heavy post, I’m going to restrain myself to just one. Okay, two, because Gomez started to yawn and it was funny. I hope all of my fellow Americans had a happy and safe Fourth of July.